I’m a rule breaker in the kitchen. To my detriment. 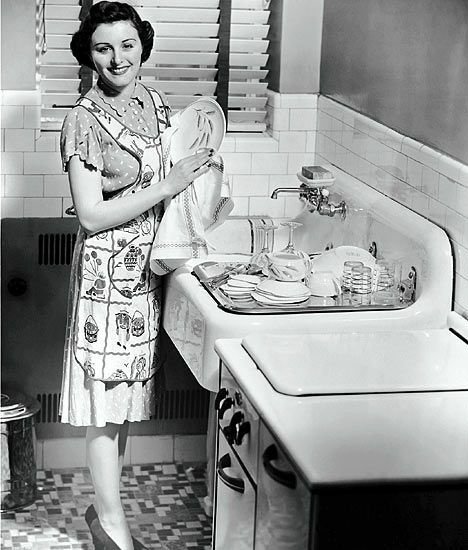 I would do 5 loads and scrub both bathrooms before I’d want to hand wash a sink full of dishes. Therefore, I pretty much always put all my pans and baking sheets in the dishwasher!!!! I know so many of you would bop me on top of the head right now if you could! I know, I know, I’m the worst! They do seem to be holding up quite well, it seems. Ha! But I do know that isn’t the best way to take care of them and make them last. I was reading about it because I got some new baking sheets this year before baking season hit and I knew I wanted to take the best care possible of my shiny new sheets so I learned a lot. And was a little humbled, I’m not gonna lie. Here are some great tips to keeping your pans nice and shiny and last longer. Even though it’s much easier to just pop a hot pan into the sink and throw some water on it, a hot sheet that hasn't had time to cool will pop or warp under immediate contact with water depending on the construction of the sheet. You had to wait for the oven to do its thing; you can handle a few more minutes for the sheet to cool down. For longest-lasting pans, you gotta give 'em a little TLC. Harsh dishwasher detergents can mar and discolor nonstick or natural finishes. In most cases, some mild dish soap, warm water, and maybe a light pass with a no-scratch scrubbie will do the trick, no matter what type of pan it is (nonstick-coated, aluminum, or aluminized steel). If stuff is a bit more stuck, soak the pan for a bit in a warm bath and try again. 3. Scrape with a spatula. Got a real mess on your hands — melted sugar, burnt-on chocolate, gummy cheese — that's too much for the scrubbie to take? While you might be tempted to reach for a knife (or an ice pick?) and hack away at the crustiness, you run the risk of scratching a nonstick coating or just denting the pan. Your best tool is the plastic spatula you used to scoop off your food; it does great double duty as a scraper. Again, a good, long soaking and some soap will help loosen things up. Sometimes greasing isn't enough, but parchment is. Sometimes a pre-greasing isn't enough. Foil can prevent stains when cooking with high heat or when you're cooking tomatoes, curry, and other colorful foods. Using parchment paper when it makes sense is a good idea, too, as it keeps foods from sticking and this in turn leads to less scrubbing. Now, what if you accidentally broiled something a little too long and your pan now looks like this?? Even if you’ve tried all your tried and true concoctions to scrub away tough stains and nothing seems to be working, don’t throw it out! There are a couple different ways you can keep using her! For one thing, you can use it to make better roasted vegetables. That's because a blackened baking sheet helps achieve the quick, deep browning that you want for roasted vegetables (even if it's not so great for cookies). These battered baking sheets are also great for other cooking tasks, especially messy ones. Let this be your designated half-sheet pan for the times when you know things are going to get a bit ugly and you have a casserole or something that might spill over. You could also use it as your tray when you’re carrying burgers and brats to and from the grill. 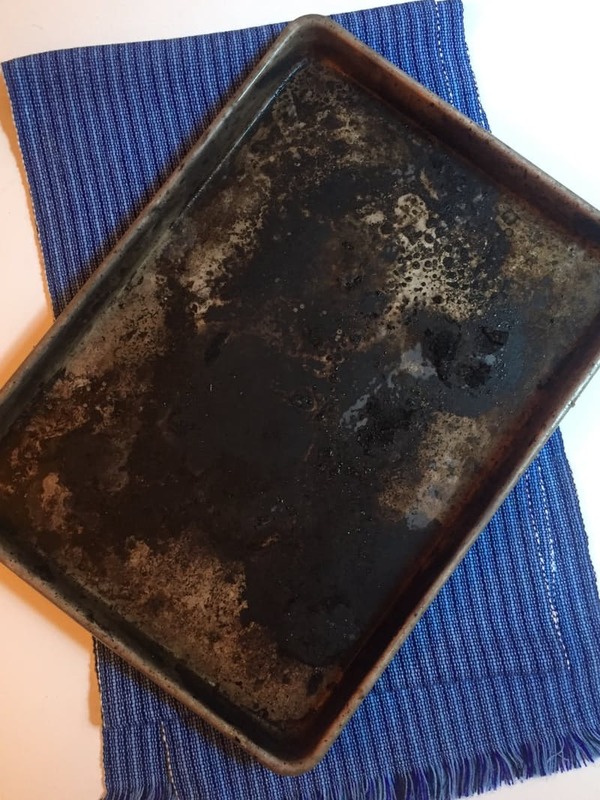 One reader talked about what she does with her beloved black pan.